Come connect with other volunteers and learn how you can work to get Allison elected on November 7. There’s lots to do – big and small, public and private. A write-in campaign is an uphill battle, but together we can do this!!! Run Paddy’s Road Race with Allison! Run Paddy’s Road Race in West Newton with Team Allison! Your registration fee will support Newton Athletes Unlimited, offering high quality recreational programs to encourage physical, social, emotional and intellectual development to individuals with disabilities. 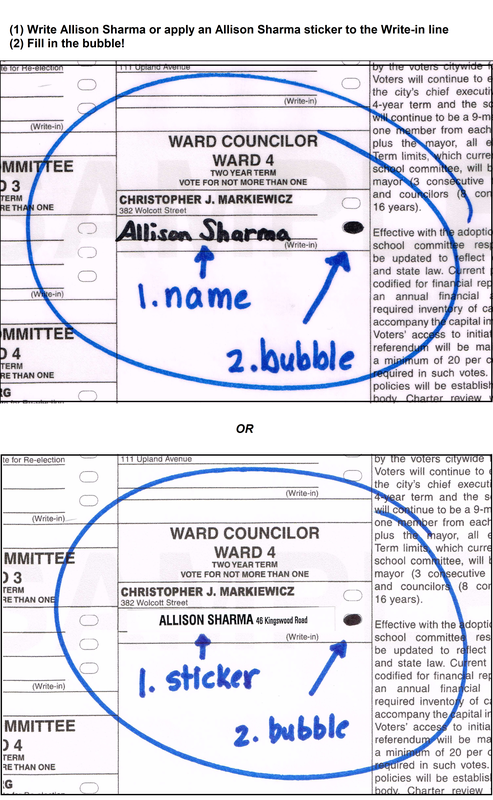 At the same time, you can raise awareness about my campaign by donning an ‘Allison for Ward 4’ tee while you run! Register yourself as an individual, then email Allison at allison.sharma@gmail.com to request a t-shirt and join in the fun!